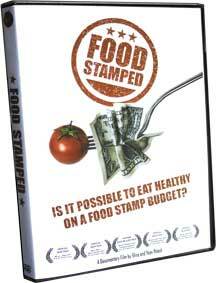 "Food Stamped follows nutritionist Shira Potash and her documentary filmaker husband Yoav as they attempt to eat a healthy, well-balanced diet on a food stamp budget. Shira teaches healthy cooking classes to elementary students in low-income neighborhoods, most of whom are eligible for food stamps. In an attempt to walk a mile in their shoes, Shira and Yoav embark on the "Food Stamp Challenge," eating on roughly one dollar per meal. Through their adventures they consult with Members of Congress, food justice advocates, nutrition experts, and people living on food stamps to take a deep look at America's broken food system." I thoroughly enjoyed this documentary and found it inspiring that a couple of ordinary working folks would endeavor to create this project for themselves. Surprisingly, there seem to be many programs available (at least in California) for those with limited funds for food. The most impressive was the ability to use food stamps at farmer's markets. How many families could benefit from such an option? Another city in New England featured a school district where the produce is grown locally and tended by an internship program for high school students. The ingenuity is really astounding and one would hope that these ideas would trickle down to other districts, cities and states. The creators of the documentary took us through their day-to-day lives living on a food stamp budget, all the while trying to maintain a healthy lifestyle. We hear about how it's impossible to eat healthily on a modest budget. Locally grown organic food just isn't available to low income families. Or is it? It was a challenge they took upon themselves and the results were quite surprising. This does sound interesting. People need to go back to cooking like they did in the 40's/50's--simple, good food that didn't really cost much. When I look back on what I ate as a youngster, none of it was expensive, but always delicious. I certainly wouldn't want a childhood of McDonalds. Blech! Sue-I know what you mean. Lil' Guy is the only kid I know who has never been to MickeyD's! I'm with Sue. You've got to cook to eat heathly and save money. Too bad so many people take the lazy way out. A dear friend was a single mother in PA 30+ years ago, and she told me recently of the state's program to help women in her situation. They had a trained nutritional counselor visit her once a week, and they would go over her menu for the week, teach her how to grocery shop for bargains and make healthy decisions for her and her baby. They also taught her how to plant many of the vegetables they ate, to save money. Imagine that! The state encouraging people to grow their own food? !